SNUPPED was kind enough to send me this tote bag so I thought I'll review for you guys! I received the marble one in size small. but a pretty good size for it's price. I mainly use this bag when I pack my things for photoshoots. It can also be used for carrying school supplies, groceries, or even the beach! 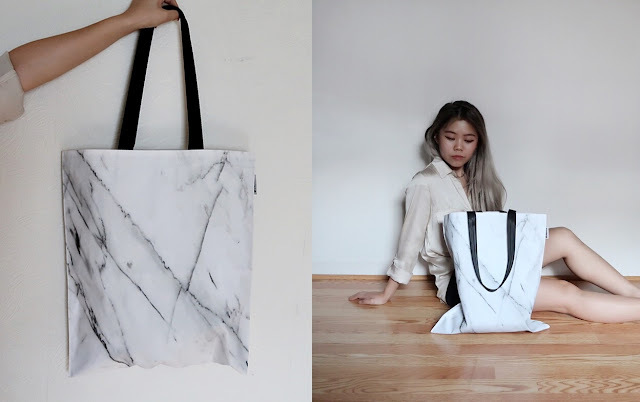 It's a canvas tote with a waterproof coating. It is a bit stiff, but hopefully, it'll be better with more use. I do like the fact that there is a slip to it so I don't have to worry about my things being wet inside if something were to spill on it or if it rains. There's also a pocket inside that you can put smaller things in. SNUPPED offers laptop sleeves, phone cases, and other types of bags, too. It also has pre-customized designs you can choose from or you can upload your own designs to make your items even more personalized. I think it will be a great for back to school and for gifts!